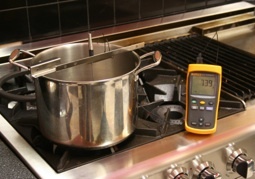 This test shows the time it takes for the Capital Culinarian burners to boil 1 gallon of water from a standing start of 75° F to a boiling point of 212° F.
In this test was carried out to establish which broiler can produce the highest temperature from the top rack position. 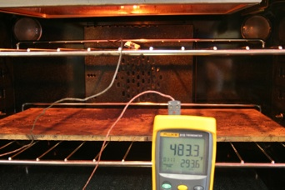 The reason I chose the highest rack position was because broiling time should be fast and ideally the food is placed as close to the broiler as possible for searing or melting. 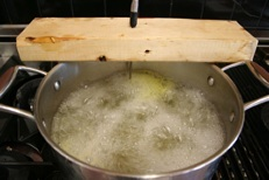 In this test we boiled 1 gallon of water (212° F) then added 1 lb. of pasta. 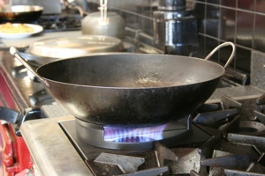 We are trying to find the recovery time back to 212° F.
In this test I show that direct heat and superior power to the base of the Wok makes a huge difference, whilst I can not show you the actual wok cooking in a test I can show the amount of heat that is directed to the base of the Wok. I racked my brain for days trying to come up with a comparison test that show the actual heat to the pan. 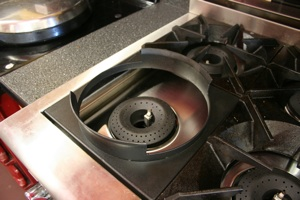 In the end I came up with putting 1/4 cup of water in a 16” Wok then turning the burner full. I recored the amount of time it took for the water to evaporate completely. 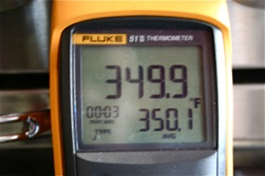 Possibly one of the most asked questions is...... “How fast does the oven reach 350 ° F."